Science-based policies protect people and our planet. At UCS we work to reduce global warming emissions; to develop sustainable food, power, and transportation systems; to fight the suppression, censorship, and manipulation of science; and to reduce the threat of nuclear war. You—our supporters—have been the driving force behind our work for nearly 50 years. We’re proud of our part in an unprecedented show of strength and public engagement by the scientific community and all who believe that facts, evidence, and expertise matter. We’re also profoundly grateful to you for making this work possible. At the time of this writing, we don’t know the results of the midterm elections—and whether candidates who vowed to restore science to its rightful place in public decisionmaking prevailed. What we do know is that UCS staff, partners, and supporters poured their all into rallying as many people as we could to vote for science and the public good this year. It’s been a tumultuous but productive year, as our scientists and advocacy staff pushed to expand access to clean energy and transportation, reduce the threat of nuclear war, prepare people and communities for the impacts of climate change, and build a healthier food system. We’ve also worked tirelessly in opposing the anti-science policies proposed by the Trump administration, with every tool at our disposal. Of course, we’d much rather be making progress than re-fighting battles we’ve already won. Nevertheless, our strategies for blocking many of the worst abuses of science have proven quite effective, as you’ll read in the pages ahead. We hope this report shows just how much your support helped us accomplish over the past year, even in the face of an intractable administration and Congress. We are energized, revitalized, and inspired anew by your commitment to stand up for science, and your dedication to UCS. There are heroic victories for a safer and more sustainable world in the pages ahead, and you are part of every one of them. It wasn’t an easy year in Washington. This was the year that science came under full attack—sometimes from industry, sometimes from Congress or the Trump administration, often from both. But we were there, and, against the odds, we helped stand up for science—and even made some progress. 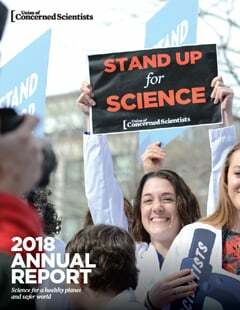 The Union of Concerned Scientists continues to benefit from the generosity of our more than 130,000 members and foundations, who work in partnership with us to build a healthier and safer world. In fiscal 2018, the majority of our support—72 percent—came from generous individual donors, while support from foundations represented 22 percent of our revenue. Planned giving represented another 5 percent of revenue. 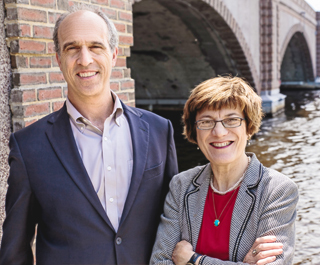 Our donors responded very generously to support our new and increased work in this challenging political climate. Eighty-seven percent of every dollar donated to UCS in fiscal 2018 directly funded our program work, with the remaining 13 percent spent on the critical administrative infrastructure and fundraising that support our programs. With an annual budget of $37 million, UCS continues to strengthen our unique ability to help solve our planet's most pressing problems with the power of independent science. NOTE: These results had not been audited at press time. The Union of Concerned Scientists is a membership organization—support from people like you helps build a healthier planet and a safer world. We are pleased that UCS continues to receive recommendations from the United States’ premier charity rating agencies, Charity Navigator, the Better Business Bureau, and Charity Watch. Our leadership team combines a deep knowledge of critical issues with management acumen to get results. Our distinguished board members contribute expertise and experience to help further our mission. Impressive leaders and experts in science, business, education, and the arts lend their time and resources to support our work.